Earlier this week, we received a number of disengagement reports from companies testing their autonomous driving platforms on public roads in California. Among the results were very impressive numbers from Alphabet's (GOOGL - Get Report) (GOOG - Get Report) Waymo unit and a worst-in-show Apple (AAPL - Get Report) . However, these disengagements reports have a few flaws. First, they're self-reported, so it's up to the companies involved to report what they consider a disengagement. Second, they're not necessary an accurate way to measure the capability of an autonomous driving system, particularly when comparing one company vs. another. That said, the situation with Apple is even more difficult. Unlike Waymo or Nvidia (NVDA - Get Report) , two companies that are relatively open about their self-driving ambitions, Apple is a vault without a key. We know the company has a massive team working on the technology, but we don't know what it's so-called master plan is. Should Apple Abandon Autonomous Driving? Being an observer of the self-driving car industry, seeing Apple's dismal disengagement rates (averaging roughly one disengagement per mile vs. one disengagement for every ~11,500 miles for Waymo) raises some questions. Some observers questioned whether Apple purposely made its disengagement rates high in order to throw others off. Short of that being the case, it's worth asking whether the tech giant should pull the plug on its autonomous driving platform. Admittedly, it's early in the race to suggest such a thing, particularly given the financial firepower that Apple has. Specifically, though, it seems like there are other areas within the autonomous driving industry that would be beneficial for Apple to explore. We already know that BMW and Mercedes have both rebuffed a potential deal with Apple, which wanted too much control. Ultimately Apple struck up a deal with Volkswagen (VLKAY for some of its T6 Transporter vans that it could retrofit with its own software and hardware for autonomous driving on and near its campus. But at this point, Waymo is the undisputed leader after having gotten started a decade ago on this ambitious technology. It's officially launched a commercial program in Arizona, is planning to expand both domestically and internationally and is looking to tap into the trucking market. General Motors (GM - Get Report) is considered to be No. 2 with its Cruise subsidiary, while Daimler (DDAIF and Nvidia could potentially be the third scalable program to market. We can never discount one thing: Apple secretly developing a best-in-class autonomous driving program, acquiring an auto brand -- perhaps an entire company given the low valuation of automakers or a singular brand from a parent company, like Porsche or Audi from Volkswagen -- and making for a rather seamless implementation of its technology. That said, Beats is the company's largest acquisition for about $3 billion, so this move would be drastic. But for Apple, why not focus on the one thing it's always done well? User interface. 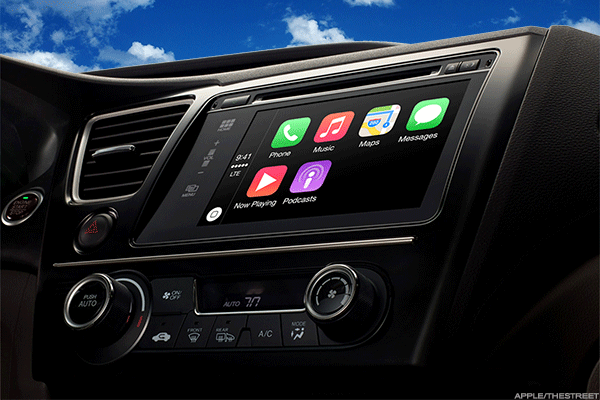 We've seen bits of it with concepts like Apple CarPlay, but if the vehicle is going to change in a revolutionary manner as many expect, Apple could be a huge player in this regard. Look at the near-iPad-sized screen in a Tesla (TSLA - Get Report) or the new Ram 1500, the North American Truck of the Year. Or look at how Mercedes is using Nvidia to implement A.I. in the infotainment system. Autonomous driving is coming because it will save lives and save money. Self-driving cars won't only revolutionize how we get from Point A to Point B, but what we do along the way, too. That's a massive market ripe for innovation and is a prime disruption spot for Apple -- provided it can come to terms with automakers on user interface and control. For whatever reason, automakers hate to give up control of their infotainment system and digital UI interface, even though a vast majority of them are cumbersome, frustrating and overall provide a poor experience. If Apple can crack into even three or four of these automakers, it would provide a huge growth opportunity, as well as a significant way to continue its burgeoning Services revenue. Apple stock climbed 30 basis points on Thursday, closing at $170.80 per share.